Necessity is the mother of invention, and that is most definitely what brought about this project. During card month here on the blog, I was using my metal dies for my cuttlebug quite a bit. The problem was that I store them in a box on a shelf and since they are tiny and thin, they would get lost. Since I am lazy and easily frustrated (the first step is admitting you have a problem), I would either avoid using them or be super cranky when I couldn't find one I wanted. You see magnet boards all over blog land and pinterest and on an on. But I didn't need a magnet board, I needed a magnetic board. Opposite of a magnet board. Since the dies are basically thin, sharp pieces of metal I needed a board with a magnetic pull behind it so I could just stick them up there when I was not using them. Maybe all this explaining isn't helping anything. You just want to see it? See all my dies magically (nay, magnetically!) floating on the fabric? Yay! It is just what I needed to keep them out on display and easy to use. Let me show you how I made it. 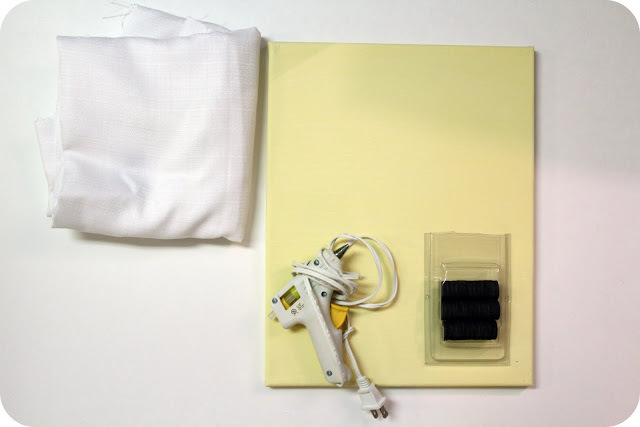 Pretty simple supply list: a wrapped canvas, material, magnets, and a hot glue gun. There are some optional things that I will explain as I go along. 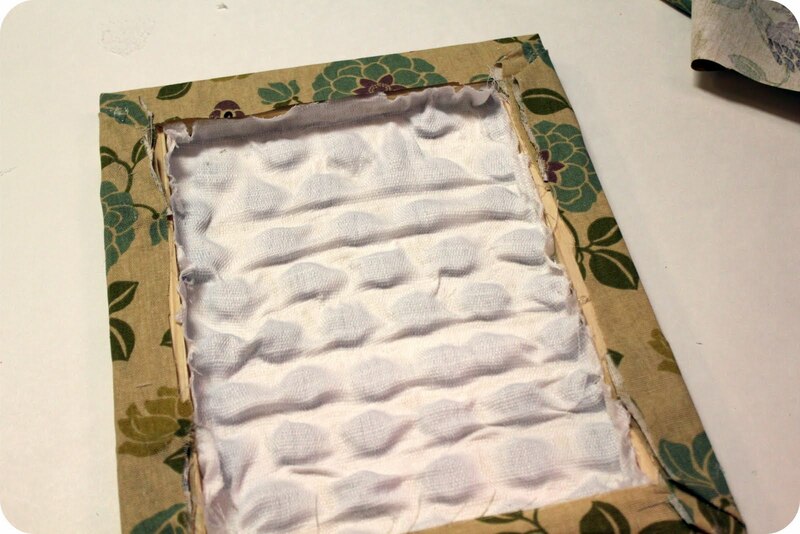 Turn your canvas over and get your backing material ready. I just used some white scrap material I needed to get rid of. Run a line of hot glue down the top of the inside of the canvas and press in your material. I suppose this is where I will start explaining my reasoning. The idea behind how I am gluing this all together is to keep as few things between the magnet and the metal die as possible. If you glue the magnets down with the hot glue, you have created basically a layer of hard plastic between the magnet and metal. 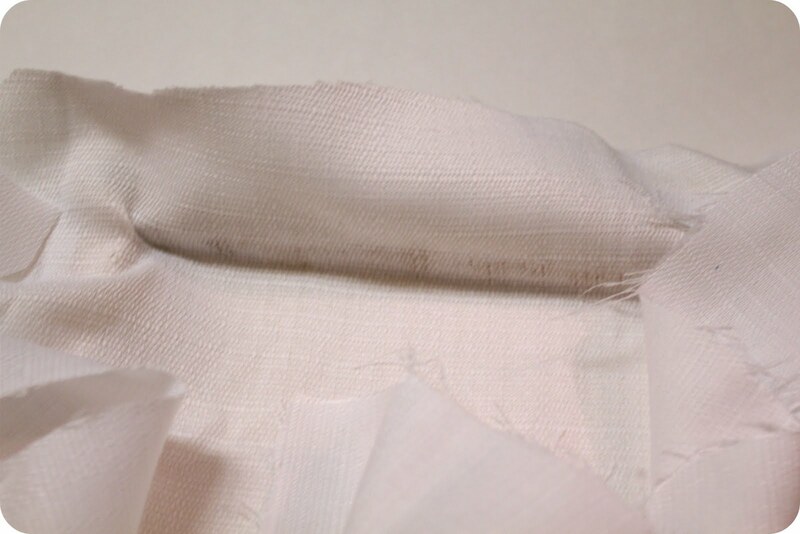 Not only do you have canvas and fabric, but also glue. Chances are that your die will not hold onto the magnet. So, what I am going to explain is how I secured the magnets. Line your magnets up far enough apart that they do not stick together. Just lay them there, no glue. 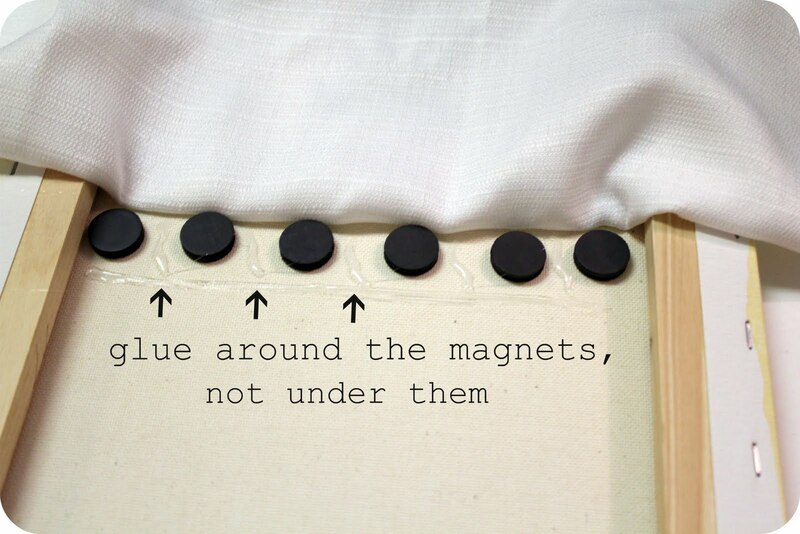 Add in lines of hot glue around the magnets, in between and a line under. 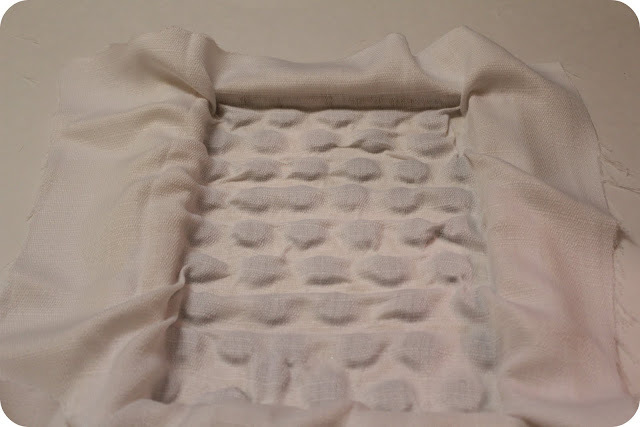 You are creating a sort of "pocket" for the magnet to lay in. You keep going, line by line of magnet pockets until you have covered the whole inside of the canvas. See how the material is glued down all around the magnets? Cut off the excess. 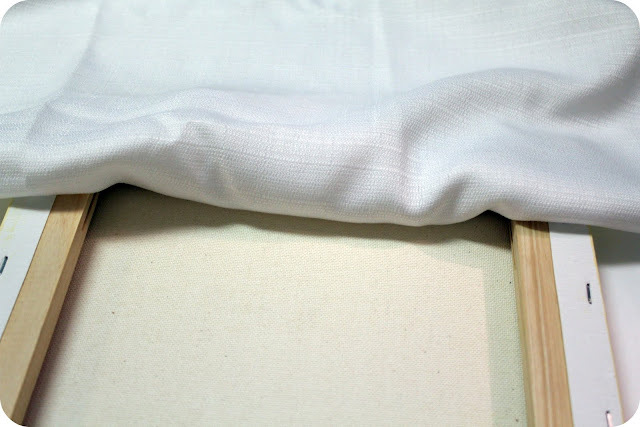 At this point, I had not planned on wrapping my canvas with material. But when I turned it over, you could see the dark outline of the magnets. Not very pretty. 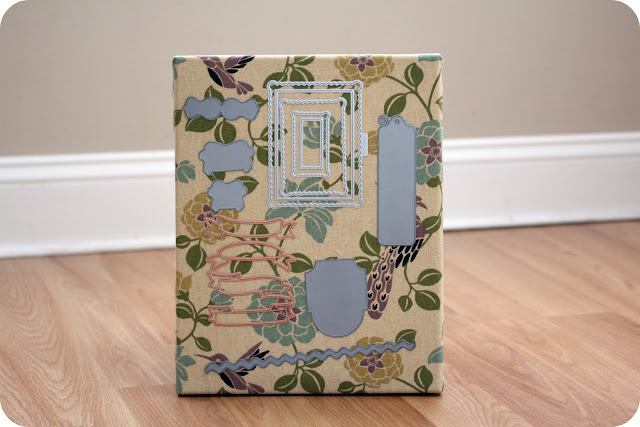 So, I used some more scrap fabric from my craft room makeover (used for these curtains) to wrap the canvas. Once again, I used hot glue since I do not have a staple gun. 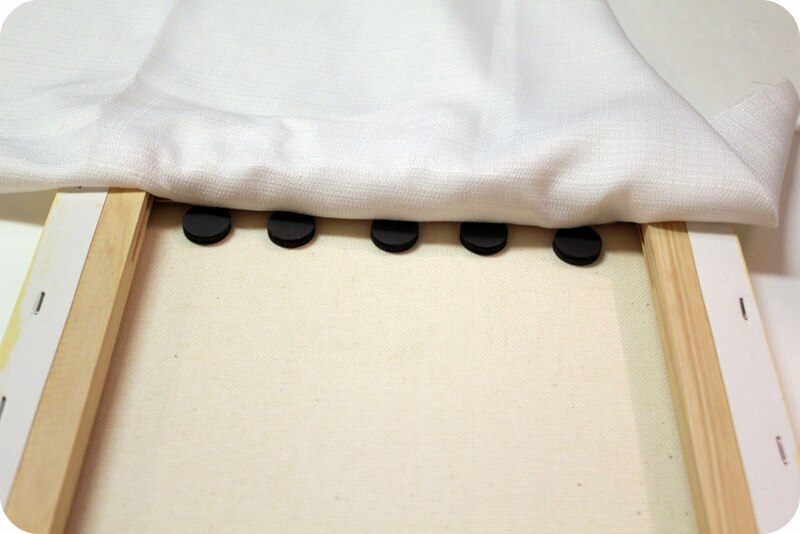 (On a side note, I got to use a staple gun while helping a friend upholster a headboard. I think I need a staple gun...) I don't have any pictures of me hot glue wrapping the fabric - basically because I just made it up as I went along. That is it - it is all done. I am really really in love with this. 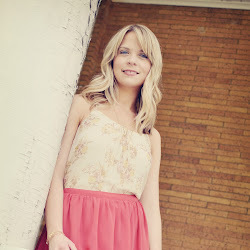 My favorite projects are the ones I make up because I have a need and I use a little problem solving to make it work. When thinking of this, I realized there might be easier ways. Maybe those large, thin sheets of magnet, but then I wondered if it would have a strong enough magnetic pull. Also, I have seen magnetic knife holders for the kitchen that would serve the same purpose, except it might not look as decorative. Other ideas?? The best part is that I did not go out and buy one thing for this project - I had all the supplies on hand so that when the idea struck at 10 at night, I was able to make it right then. Hope you like (love) it as much as I do! WOW its really great!! I would have a go, but unlike you, I dont just have all the supplies ..or ingredients as i like to call them... on hand! Its deffo worth purchasing some lil magnets for, if it means i can make a magnet board that would match my room! Great idea. I've been trying to come up with a storage idea for my dies too. I'm trying cd cases but not quite sold on them 100% yet. Some I was able to cut apart the packinging and use that in the cd case and in others I cut up some thin magnet and stuck to the cd case to hold the cd's in. I have some larger dies now that won't fit in the cd cases so I really need a new idea. Something like this might work for a them - thanks for sharing. Love, Love, Love it!! Awesome project - thanks for sharing! looks great, & you're right, a magnetic board is perfect for storing dies. 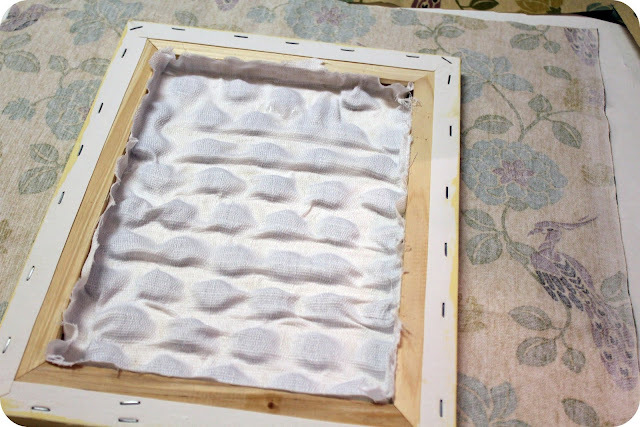 At Home Depot (or similar stores) you can purchase very inexpensive magnetic sheets that are usually used to cover air vents. I just use mine as-is but your idea to pretty 'em up is good. Pretty dang brilliant. Love your thinking about not putting the glue between the magnets and the canvas.